RANDOM: KILLLER CORPSE "Death Rising"
Besides the surging of Thrash infested bands lately, I also realized the death Metal troops creeping up quite healthily in the local scene too. And do take note that most of them are quite good actually, to say the very least. 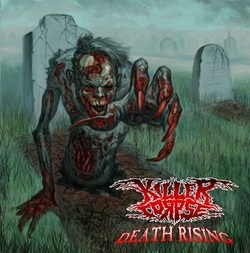 Enter out of nowhere (for me) KILLER CORPSE with this, their MCD "Death Rising". Bowing their heads towards the once glorified Florida, US death Metal deathbed; with a tendency for that doomdeath heavier hoarding of song structures. Nothing groundbreaking, yet they do it decent enough. There's also some similarities with the equally promising HUMILIATION to be found here too, check out "Horror Of War"for example, it will fit perfectly tact with any HUMILIATION releases comfortably. Even the production stays close to that of their counterpart. But I dare say KILLER CORPSE seems to be a bit more varied, as this fine MCD release shows. Decently packaged as well and for the right price to pay. Death Metal worth listening.